Expedited Shipping: do not count current day. Start counting with day after shipping day. Arrives in One UPS day. Order by 1 pm PST (4 pm EST) for same day shipping on most items. Call for time critical shipments. USPS and UPS shipments may be delayed for various reasons, weather related or otherwise. USPS Priority Mail 2-3 day typical delivery time, although delays are possible. Most orders placed before 1 pm (PST) on weekdays are shipped the same day.. Allow 3-4 extra days for Jaipur Rugs, and 1-4 weeks for Puff Chair items. All delivery transit times are approximate. The only guaranteed delivery service is UPS Next day Air. None of the delivery services deliver on Sunday. USPS Priority and Express mail deliver on Saturday. UPS delivers Mon-Fri.
For free shipping we decide the best carrier. Our preferred shippers are UPS ground for gift items, and Fed-Ex ground for furniture. Orders over two lbs, after packaging, must have a street address to qualify for free shipping (no PO Boxes or APO). We may ship orders two lbs and under via USPS. We use Fed-Ex Ground for most furniture shipments, and they ship out of Chicago, Illinois. (Fed-Ex ground delivers Tuesday through Saturday. Signature may be required.) Furniture items take one to four weeks in production (mostly in the two to three weeks range). Note that expedited shipping on furniture only expedites the shipping, not the production. 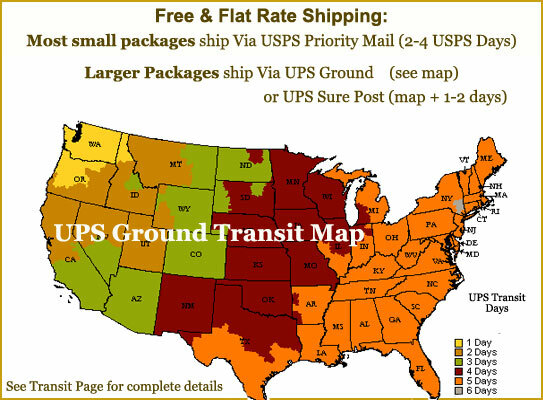 Free shipping applies to purchases over $69, and is valid only on ground shipments to one location within the contiguous 48 states. We actively verify all international credit cards. You will need access to your account on-line or to your card's customer service. This verification process may delay shipping by several days. We ship international shipments via US Post. We use First Class International (under 4 lbs), and Priority Mail International (over 4 lbs). Transit times are typically 3-14 days plus customs time. Delays in customs are extra. Note that there might be some duty charges on cross border shipments.